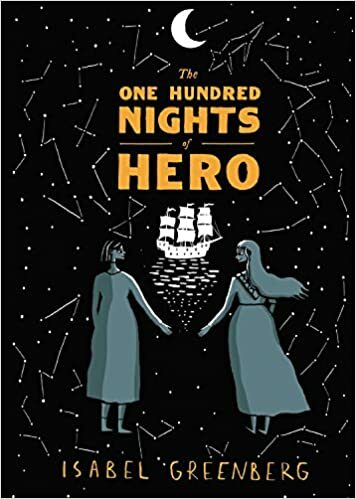 I adored Isabel Greenberg's The Encyclopedia of Early Earth, so as soon as I heard about her new book The One Hundred Nights of Hero, I put it on hold at the library. And this book was just what I needed. It's all about women being amazing, about the power of stories, about the importance of resisting, even in the face of inevitable failure, and so much more. I debated whether I should review this book or not because it's one of those books that I just really loved because it was kind and beautiful. 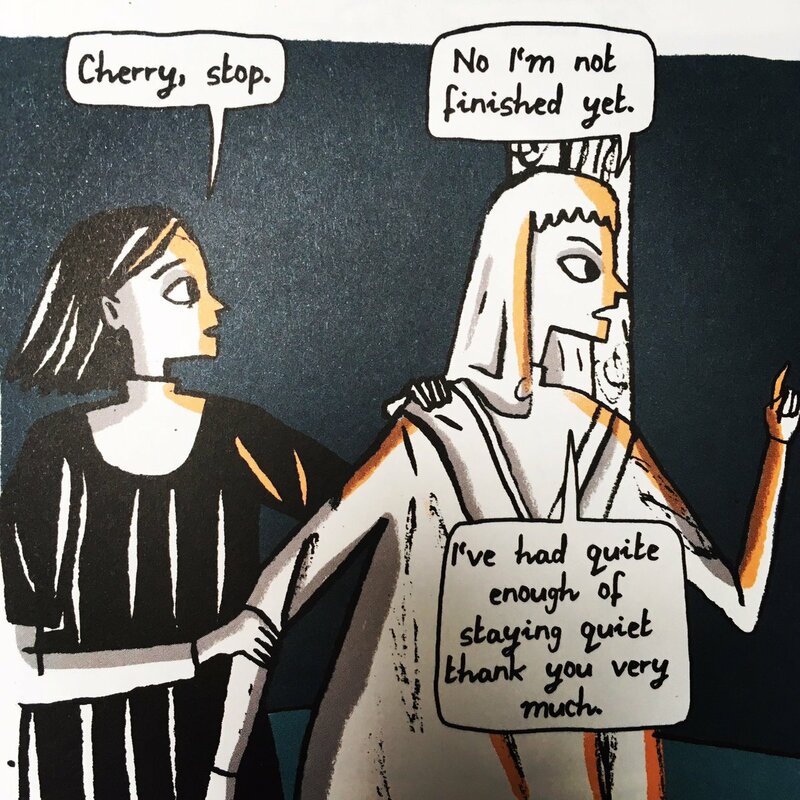 However, The One Hundred Nights of Hero tackles some really big topics in a gloriously feminist way. While The Encyclopedia of Early Earth was complex in its layering of stories within stories, the stories themselves were not super complicated (that I remember) and the story was centered on a man seeking love. The One Hundred Nights of Hero is centered on two women in love. Cherry is married to an imbecile who challenges his friend to seduce her in 100 nights. His friend agrees, and is pretty clear that if seduction doesn't work, force will. Cherry and her love, Hero, come up with a plan to distract the nefarious villain with stories each night. But not just any stories, stories about women and the power of knowledge and the importance of choice. In none of these stories is there a happy ending of "Girl meets boy, girl marries boy, they live happily ever after." There are stories of love and how beautiful a thing it can be, but Greenberg always stresses that the ability of a woman to choose her fate is equally, if not more, important. Some of the stories end happily because women find ways to live independently. Many of them end sadly because the women featured in them do not fit neatly into the strict definitions that patriarchal societies have set for them. That makes it sound as though this is a melancholy and depressing book, but it is not that at all. It's absolutely amazing. There is so much humor, so much kindness and friendship and loyalty, and glorious sisterhood. Also, the illustrations are beautiful. And then, of course, there are the stories. It's an excellent, gorgeous book, and I intend to splurge and buy some Isabel Greenberg for myself for my birthday this year - she's absolutely worth having on your keeper shelf. This one sounds amazing. I hadn't heard of Greenberg before. Okay, I'll give this a try! The Encyclopedia of Early Earth wasn't perfect for me -- it felt a little less substantial than I wanted it to be -- but I wanted to like Isabel Greenberg. I wanted it sufficiently to give her another try! I'm glad you posted about this one; sometimes it's harder to write about books that one simply likes but of course one has very good reasons for liking them and when you think about it, they can be plenty revolutionary (as seems to be the case here)!